There’s no breakfast food quite like an omelet. These egg-based dishes can be jam packed with meats, cheeses, vegetables, and other tasty toppings. Firmly planted in the upper echelon of breakfast foods is the Denver omelet, popularizing the food out West. However, Arizona is home to its own massive omelet creations that rival even the best of Denver omelets. Here are the 10 best places to grab an omelet in Arizona. El Paso may not be a Phoenix city, but it feels right at home at Original Breakfast House. Original Breakfast House serves up intense flavors and huge portions in their Phoenix restaurant. This is on full display in the El Paso Omelet. The three-egg omelet is stuffed with spicy chorizo, roasted green chiles, black beans, onion, and tomatoes. It’s also topped with southwestern favorites like guacamole, pico de gallo, and sour cream. If breakfast is the most important meal of the day, then Butterfield’s might be the most important restaurant in the Valley. This quality breakfast joint has a stellar menu filled with tasty entrees and sides. You can get creative by going with the make-your-own omelet option. Then again, there’s nothing wrong with going for a tried and true option. The Mexican is a large omelet filled with tasty southwestern ingredients. It comes with chorizo sausage, avocado, onion, and your choice of cheese. You can also add some spice by smothering your omelet in New Mexico green chile sauce. The Breakfast Club serves up some of the best morning meals in Arizona. If you’re looking for an omelet that will keep you full until dinner, try the Bird. The Bird is a turkey filled omelet whose size rivals that of an actual bird. This massive omelet is also stuffed with mushrooms, avocado, boursin cheese, and is topped with crème fraiche. This popular dish is one of Breakfast Club’s signature items. It’s also so big you can enjoy leftovers for a second or third helping. T.C. Eggington’s is all about eggs. This award-winning restaurant claims to scramble, fry, and poach over 8,000 eggs each week. While they have a variety of tasty omelets, the O’Pear Grenache is the clear favorite among regulars. This sweet tasting omelet is made with three eggs, Bosc pear slices, melted Havarti cheese, sliced almonds and crispy bacon. The rich flavor, large size, and unique ingredients make this one of Arizona’s top omelets. Laverna’s omelets are big enough to share. Thanks to their amazing taste, however, you won’t want to give up a single bite. This small Tucson breakfast spot is famous for its large four egg omelets. Their best is the Green Chili & Cheese, which fuses melted cheese with spicy chili. The omelet is also served with hot salsa and your choice of side included crispy hash browns or the filling biscuits and gravy. Robert’s Restaurant specializes in good tasting, made-from-scratch food. Their fresh and healthy approach is on full display in the Mediterranean Omelet. This three-egg omelet includes fresh spinach, feta cheese, and roasted red peppers. It also comes with toast and American fried potatoes or hash browns. 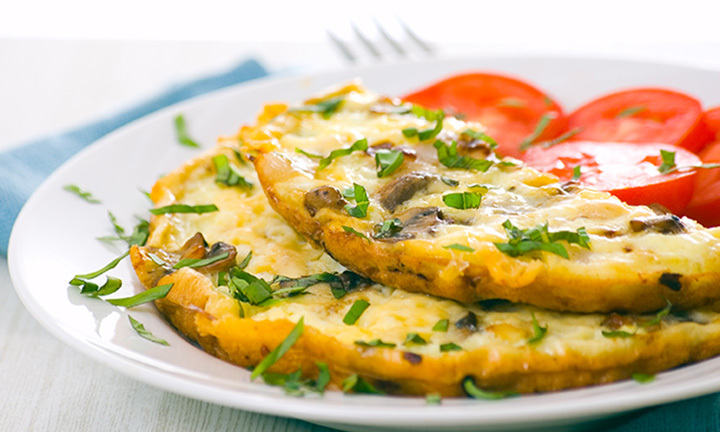 This tasty, greaseless omelet is perfect for the health-conscious breakfast eater. There is no such thing as a pretty good omelet. That’s the motto at the Mix in Flagstaff. This friendly neighborhood breakfast joint has a variety of tasty omelet options, none better than the Southwest. The Southwest highlights an array of Arizona-friendly flavors. It’s filled with chorizo, ham, green chiles, bell peppers, cheddar cheese, and green onions. It’s also topped with house made black beans and salsa. The Southwest also comes with filling sides like your choice of hash browns, breakfast potatoes, or bacon. The Toasted Owl is a small café located in historic downtown Flagstaff. They specialize in healthy, fresh food and inventive recipes. One such recipe is the prosciutto and brie Omelet. This delicious twist on a classic omelet has generous portions of thinly sliced prosciutto and brie. Eating this creation is like having bruschetta for breakfast. You don’t have to be a meat lover to enjoy a tasty omelet. Vegetarians can head to Fàme Caffé in central Phoenix to satisfy their omelet cravings. The Parisian Omelet is a popular dish for both vegetarians and meat eaters alike. This omelet incudes four eggs whites, Gruyere, mushrooms, spinach, caramelized onions and chives. It also comes with toast and a seasonal selection of fresh fruit. If you’re looking for a farm breakfast, look no further than Sweet Potato Café. This bustling diner dishes up hefty portions of classic American breakfast food. Their omelets each come with your choice of hash browns or home fries and pancakes or biscuit and gravy. Meat lovers will love the Big Boy Meat Omelet. It’s a light and fluffy omelet filled with bacon, sausage, ham, and cheese.